Knead Archives - Wots For Lunch? Have you noticed the seasonal change in the weather recently? In Cape Town the evenings have a slight chill to them signalling the onset of Autumn and I think that is the perfect excuse to create giant pots of warm and comforting soup. 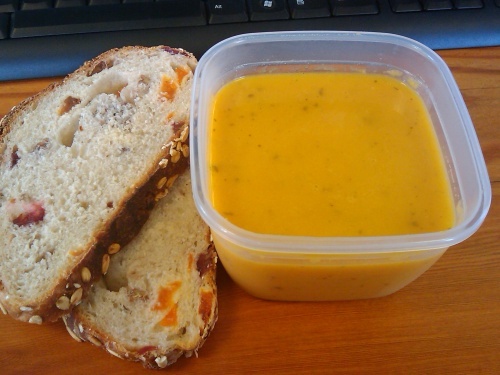 Like this Thai flavoured butternut soup I made last night. two slices of muesli loaf from Knead. Here is my recipe for Thai flavoured butternut soup. Sauté the onions and garlic in the coconut oil until the onions are translucent. Add the butternut and stir-fry for a minute or two to coat with the coconut oil and brown slightly. Remove the lemongrass and lime leaves and then blend to a smooth consistency. Stir in the coconut milk, fish sauce, coriander and lime juice, bring to the boil and serve.